Make sure to check out our reviews for 'Adventure Time: The Complete First Season,' 'Adventure Time: The Complete Second Season,' and 'Adventure Time: The Complete Third Season' as well! Eleven minutes. 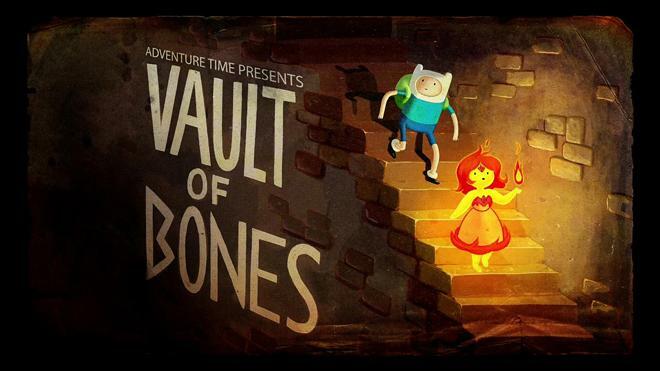 That's the average runtime for a single episode of Cartoon Network's 'Adventure Time.' That's it. Just eleven minutes. But in those brief, exciting, hilarious, bizarre, enchanting, and sometimes downright devastating eleven minutes, the show's writers and animators are able to capture something truly magical. In those eleven minutes, 'Adventure Time' is able to weave some of the most delightfully whimsical and surprisingly emotional storytelling on TV -- packing more heart and creativity into each of its brisk installments than most shows have in their entire seasons. Picking up where season four's nail-biting cliffhanger left off, the fifth season finds our heroes, Finn (Jeremy Shada) and Jake (John DiMaggio), battling the evil Lich King. With the fate of Ooo in the balance, the resourceful pair will have to outsmart their enemy or risk the destruction of the universe itself. From there, the remainder of the season offers a mixture of more episodic misadventures in dungeon crawling and random quests, and more serialized installments that continue to flesh out the show's growing mythology and increasingly deep cast of supporting characters. From dungeon trains and crime heists to detective mysteries and wedding celebrations, these 52 episodes are in no shortage of varied and amusing plotlines, thrusting our protagonists into numerous silly and imaginative scenarios that play up the show's trademark sense of absurd humor and witty creativity. Simple premises like a potluck party or a contest to see who can go the longest without talking always manage to yield entertaining results, and more decidedly bizarre plotlines, like an encounter with an inspirational horse who balances on a beach ball, prove that the show hasn't lost any of its penchant for quirky silliness. With that said, season five does bring a slightly more sophisticated sense of storytelling to the proceedings that features more fleshed out plots and less of a reliance on seemingly random absurdity (though, that is still there, thankfully). Likewise, the writers continue to experiment with unconventional high concept episodes that offer creative breaks from the series' standard installments. Highlights include another "Fionna and Cake" story, a trip to a parallel world, a 3D animated episode, and an excursion to a pillow populated land that serves as Finn's own version of "The Inner Light" from 'Star Trek: The Next Generation.' And along with all of these fun episodic adventures, the show also continues to evolve its sense of continuity, resulting in one of the series' most serialized seasons to date. To this end, season five features several ongoing plotlines that develop over the year and numerous revelations about character histories and the land of Ooo itself, slowly but surely enriching the show's growing mythology. 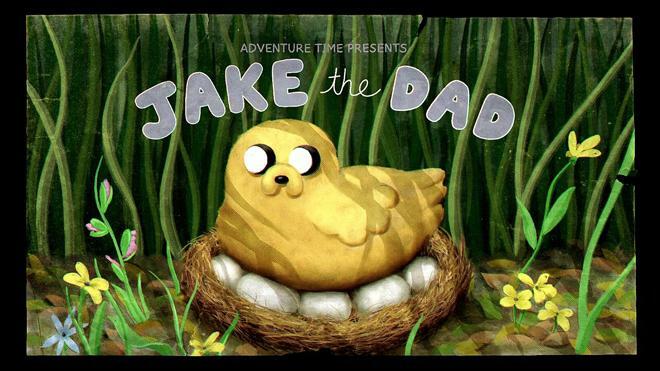 Major story beats for the season include Jake's struggles with fatherhood, Finn's tumultuous romantic life, the ongoing conflicts in Lemongrab, and the tragic origins of the Ice King. Those latter two arcs lead to some of the show's most poignant and ambitious episodes, revealing a surprisingly affecting sense of melancholy and emotional complexity. 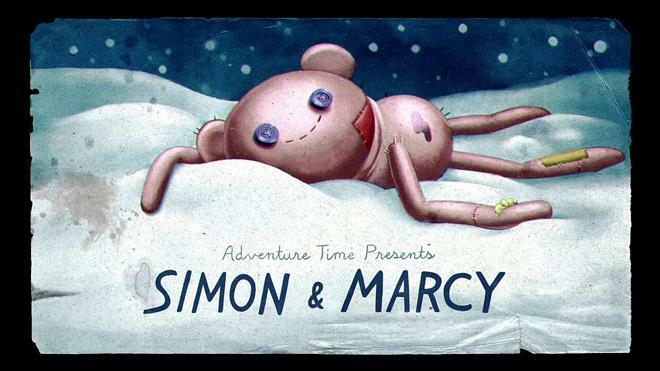 "Simon and Marcy" and "Betty" both prove to be standout episodes in this regard, continuing storylines that originated in season three's "Holly Jolly Secrets Part II" and season four's incredible "I Remember You." As we learn more about the Ice King's history, the writers delicately weave an utterly heartbreaking story about a caring man forced into madness, delving into the kind of bittersweet pathos that most children's shows deliberately avoid. Likewise, these installments enrich the relationships between the supporting characters, expanding upon previously unknown connections. Similarly, the evolving Lemongrab story arc ends up packing quite an emotional punch. Though this plotline starts out as a rather creepy (and occasionally annoying) look at a dissolving kingdom under terrible rulers, the story gradually grows into an epic tale about a young boy becoming a hero while accepting responsibility and facing his past. To this point, the conclusion to the season's "Lemonhope" two-parter easily ranks among some of the most emotionally resonant material that the show has ever produced… and stars Finn and Jake barely even make a cameo. From its humble yet endlessly creative beginnings, 'Adventure Time' has steadily evolved into a genuinely affecting and narratively rich series, mixing episodic fun with serialized storylines, expanding mythology, and poignant revelations. This is a show that can somehow go from making a fart joke to revealing a heartbreaking development without ever missing a beat, creating all-ages entertainment that works on every level that can be imagined… and perhaps even some that can't. Warner Bros. brings 'Adventure Time: The Complete Fifth Season' to Blu-ray on two BD-50 discs that come housed in a keepcase with a cardboard slipcover. 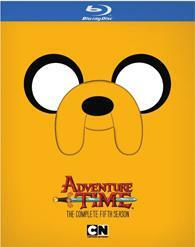 Much like the previous seasons, in a fun little design choice, the slipcover is shaped to look like Jake. When the slipcover is removed, the full cover art exposes the character eating a sandwich. A code for an UltraViolet digital copy is also included. After some skippable trailers, the screen transitions to a standard menu. The show is provided with a 1080p/VC-1 MPEG-4 transfer in the 1.78:1 aspect ratio. Essentially identical to the previous season sets, this is a great video presentation that brings the series' simple yet wonderful animation style to life with no major issues. The digital source is mostly crisp and free from artifacts, but there is some fleeting banding visible in isolated shots. The show's trademark animation style has never been a showcase for sharp fine details, but the unique artwork remains pleasing with clearly defined lines, characters, objects, and backgrounds. Colors also continue to be a highlight, with bright hues and great pop, rendering the land of Ooo and all of its inhabitants with sparkling saturation. Contrast is also well balanced with stable whites and inky blacks that don't crush. With that said, instead of revealing an all black screen during some fades and transitions, the image appears as a solid grey instead. This doesn't affect the picture quality at all, but it is worth noting. 'Adventure Time' continues to impress with its colorful and clean animation style, and thankfully this Blu-ray transfer is just as strong as the previous releases. The series is presented with English Dolby Digital 2.0 audio along with optional English SDH subtitles. Just like the previous season releases, all we get here is a lossy mix -- but the sound design remains energetic and fun. Dialogue is clean and full with no balance issues, highlighting the memorable and distinct voice acting. Stereo separation is strong, naturally spreading effects work across the front two channels. Though the lack of a lossless surround mix does once again limit the track's sense of scope and range, action scenes are still lively and exciting, sending sword slashes, screaming lemons, and magic spells to the left and right. Music continues to play a large part in the series as well, and all of the catchy songs come through nicely. Thankfully, there are no technical issues to report. At this point, standard Dolby Digital 2.0 tracks are simply par for the course when it comes to 'Adventure Time' on Blu-ray, and though not ideal, the audio is still brimming with personality. Adventure Time Forever (HD, 16 min) – Presented in 1080p with Dolby Digital 2.0 sound, this a fun behind-the-scenes featurette that looks back on the creation and continuing popularity of the show. Several members of the crew discuss the production's early difficulties, finding the series' tone, the growing fandom, and the show's unique appeal to all ages. Animatic Clips (HD, 23 min) – Animatic clips for 24 episodes on Disc One are included. Animatic Clips (HD, 22 min) – Animatic clips for 25 episodes on Disc Two are included. 'Adventure Time: The Complete Fifth Season' is one of the show's strongest seasons to date, evolving the series' mythology and serialized aspects without ever sacrificing its episodic creativity. Video and audio are on par with previous releases, offering a good technical presentation that should please fans. Though supplements are pretty slim this time out with no commentary tracks, the included featurette is worth a look. With its growing sense of continuity and emotional complexity, 'Adventure Time' only seems to get better with age. This is all-ages animated entertainment at its best. Highly recommended.